In 2013, the Rana Plaza factory complex in Dhaka Bangladesh collapsed, killing more than 1,130 people and injuring another 2,500. According to reporting by European Center for Constitutional and Human Rights, subsequent investigations found rampant human rights abuses including “grave human rights violations such as child labor, discrimination against women, the absence of trade unions and forced overtime.” Despite this, the facility had been audited a year prior for safety and working conditions by TUV Rheinland, against the social accountability workplace standard known as the “Business Social Compliance Initiative” (BSCI), an offshoot of the prior SA8000 standard. Since then, TUV Rheinland has faced no legal consequences. 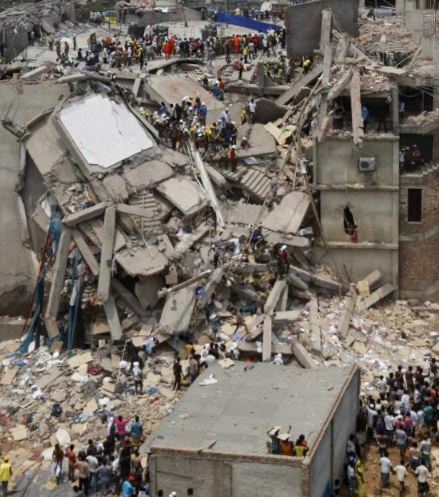 The certification body agreed to participate in third-party managed mediation in 2018, which would have allowed TUV to provide a “humanitarian gesture” of compensation for the Rana Plaza victims, without acknowledging guilt, but the talks fell apart without any final resolution. TUV Rheinland faced another global controversy over the PIP breast implants which were found to include industrial-grade silicone rather than required medical grade, despite the manufacturing holding a TUV Rheinland “CE” mark. TUV was found culpable in European courts in that case, which resulted in several deaths and cancer risks to tens of thousands of patients worldwide. Routinely, certification bodies such as TUV escape legal consequences due to connections with government agencies, ties to international organizations such as ISO and the WTO, and by obscuring their liability through a complex and confusing web of accreditation rules, third parties and official-sounding policy documents. UPDATE 4/1/2019: This article was edited to emphasize that TUV’s audit consisted of working conditions; the previous article suggested that TUV had audited the structural aspects of the building.